Massacre carved a place for themselves in the death metal community years ago and with their foundational From Beyond, an album of tremolo-picked columnar death metal with big fuzzy production at a time when many death metal bands were still trying to emulate the muted-picked speed metal of the previous era. Over two decades later, Massacre returns with Back From Beyond which sees release on April 1, 2014 via Century Media records. 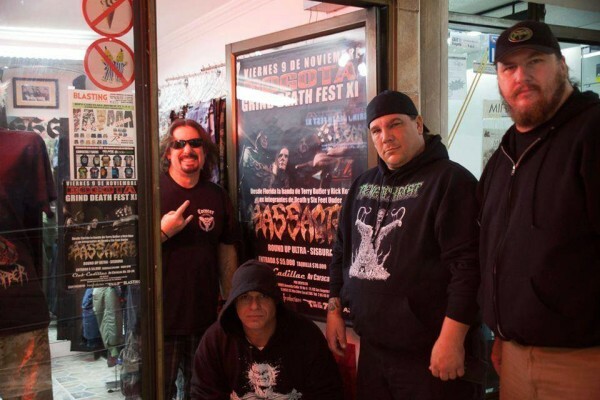 We were fortunate to be able to grab a few words with bassist Terry Butler, whose work with Massacre, Death, Six Feet Under and other Florida death metal bands has made him a towering legend in the community. You’re about to unleash a new work, Back From Beyond. Since the title effectively compares it to your breakthrough album From Beyond, can you tell us: how are these albums different in approach, in style and in production? In the case of From Beyond, the songs had been written five years prior, so when we signed to Earache, we just jumped in the studio and recorded them. We tried to keep the production simple and raw. The approach for Back From Beyond was “let’s not rush and re-hash songs for a quick release.” We took our time with the songwriting and production. It’s been 22 years, why rush? The production is better on Back From Beyond. Tim Vasquez did a great job! What do you think Back From Beyond is adding to death metal, twenty plus years past its inception? We are just playing Death Metal the way we like it. Heavy riffs, catchy in your face and brutal. I like rhythms I can remember. As far as adding something new, no one is adding something new these days. It’s all been done. We are just doing what we do. You released an EP, Condemned to the Shadows, in 2012. How different is that material from what we’ll hear on Back From Beyond? It’s musically in the same vein. More of the same basically. We re-recorded the two tracks from that EP. They are sonically different and production-wise sound different. Can you tell us how Massacre assembled? I know it pre-dated Death, but after Death fragmented the members came together for From Beyond. Can you connect those dots for us? Bill Andrews formed Massacre in ’84. At that stage it was mostly covers. Kam [Lee] joined in ’85 and a three-song demo was released. Rick [Rozz] joined in ’86 and a four-song demo was released. In early ’87, Rick, Bill, and I joined Death. After four years in Death, Bill and I contacted Rick, and Massacre was back together. We signed to Earache and put out From Beyond and Inhuman Condition. After several tours the band split up again. Now 22 years later, we are back. That’s the gist of it. In a nutshell. At the time when From Beyond came out, most of Florida death metal was focusing on blasting and choppier, more muted strum percussive riffing. Massacre went for the full on fast-tremolo strum and big fuzzy burly warm sound guitar production. What made you take this different path? That’s the Massacre sound and philosophy. Rick was in Mantas in ’83 writing this way and in Death in ’84 and ’85 writing this way. He wrote most of the material on From Beyond. He wrote half of Leprosy. I co-wrote four songs on Spiritual Healing. So what I’m trying to say is: this is our style. The songs on From Beyond were written in ’86. No disrespect to blasting, but the Massacre sound was cemented years before. Do you think your different path helped ‘From Beyond’ achieve the cult status it has among death metal devotees? Yes, in a way. The band didn’t at the time, no, but we were influencing the likes of Napalm Death, Carcass etc. Joining Death, then coming back and putting out From Beyond only helped the status of Massacre. The whole time I was in Six Feet Under, people kept asking about Massacre. For the band to still be relevant in 2014 speaks volumes about the music! Was Bill Andrews unable to make the reunion? Is he still into death metal at all? Unfortunately… no. He doesn’t play anymore and doesn’t listen to Death Metal. I still talk to him regularly though. He lives in Japan now. Rick Rozz has an entirely unique guitar style marked by, among other things, “whammy bar abuse.” What influenced this style, and are we still going to hear the torturing of whammy bars? The whammy bar is still in effect and deadlier than ever ha-ha… He draws a lot of influence from K.K. Downing and Kerry King, as far as the whammy goes. I personally think it’s a lost art these days. What do you think determines whether a band is death metal or not? Is death metal the same genre it was back in 1992, or has it changed? I think it’s mix of music and vocals. Obviously the first thing is vocals. If you put opera vocals over Cannibal Corpse songs it’s not Death Metal, and if you put Cannibal Corpse vocals over Journey songs it’s not Death Metal. Darker, heavier music with low brutal vocals is the formula for Death Metal. I believe Death Metal has changed since ’92, a bit. There are more off-shoots, such as Black Metal, Crust, and Grind, these days. I think Death Metal back then was more about riffs and grooves; now it’s about speed and fashion. About what mix of old/new songs do you think you’ll play on tour? How are you preparing for the tour? The mix will be about 50/50. We still have to play the hits ha-ha. We will practice as much as possible for the tour. From Beyond featured mostly “mythological” lyrics, drawn from Lovecraft and horror movies. It wasn’t so much “social consciousness.” Do you think metal tends toward a mythological direction? I think it’s a mix of both. Obliviously you have your satanic lyrics and religious themes, but a lot of bands do sing about current events. The satanic and mythological lyrics are kind of written for you already. How do you all feel about launching a huge new album and tour two decades after you started out? Did you ever think Massacre would get this big? I think it’s amazing and we are very excited about it. Like I said earlier , it says a lot about our music that we are still relevant after 22 years.